The ingredients Wild Wash use are incredibly healing and have produced astounding results for animals with skin and coat problems. Wild Wash receive daily testimonials from their clients who have witnessed the wonderful results that our natural, well researched shampoos can give. The products are great value. They all dilute at 32 to 1. They have designed there own mixing bottle and a 1 x 30ml portion of shampoo mixed with water is all that is needed to shampoo a horse. This means a 1litre bottle can give you up to 33 washes. 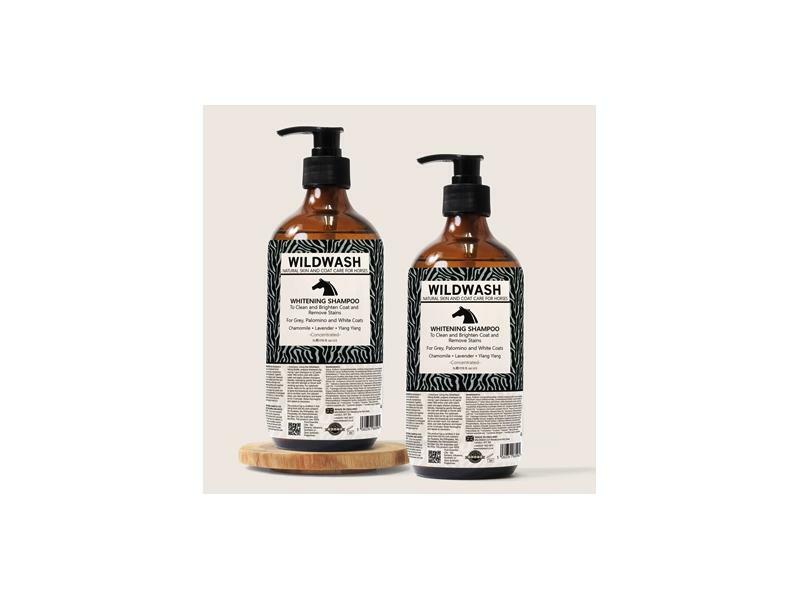 Wild Wash shampoos are natural and sulphate free and there is a very low lather. They have been programmed to believe that a high lather is needed but in fact a high lather does not help the washing process at all. A high lather takes a long time to rinse out and leaves a residue in the coat. When using WildWash products, the rinsing out process is very quick and you are constantly trying to get rid of the bubbles. The coat also dries in half the time leaving the coat soft and shiny. The difference is incredible. We chose Yarrow, Angelica Leaf, Calendula and Nettle to form the base of our shampoos, as we believe they have qualities that will benefit all horses. Yarrow is a superior remedy for cuts and wounds. It has an antiseptic action against bacteria for healing. It also cuts through grease and brings out a wonderful shine in the coat. Calendula also has a long history of use as a wound-healing and skin-soothing botanical. This lovely marigold like flower (although called pot marigold, it is not a true marigold) is considered a vulnerary agent, a substance that promotes healing. Calendula also has anti-inflammatory and weak antimicrobial activity. It is most often used topically for lacerations, abrasions, and skin infections. Angelica Root has been used for hair loss treatment for centuries by the Chinese. Enriched with Vitamin E, it helps in stimulating the circulation of oxygen in the body and the scalp. It helps to promote the metabolism and replenishes the nutrient supply in the body, which are essential for the growth of hair. It helps to oxidize blood, which eventually helps in the oxidation of hair cells. It also promotes the regeneration of damaged hair cells. Nettle leaves have anti-inflammatory properties and historically have been used for treating skin burns and reducing burn scars, as they are very healing. Using Nettle Oil is one of the oldest treatments for combating hair loss effectively. Other ingredients we use throughout our range are Organic Aloe Vera, Neem, Sea Kelp and Evening Primrose Oil. Aloe Vera is an extraordinary botanical and trusted ingredient for use on the skin and coat. It is known to hydrate the skin whilst soothing and promoting skin renewal. Aloe Vera also produces at least six natural antiseptics, which are able to kill bacteria and funguses. Neem Oil is extremely beneficial and has anti bacterial, antiseptic, anti fungal and anti parasitic properties. It is an amazing soother for the skin and it helps to relieve dry and itchy skin, as it is also an effective skin conditioner. It is known for its ability to increase hair growth and repair damaged hair cuticles. It can help with skin infections and works well to deter insects. Sea Kelp is known as the superfood for skin and hair. It helps to soothe and moisturize and retain moisture in the skin. It can also help to strengthen the hair and give it shine. Evening Primrose Oil will help boost cell repair in the skin and coat and will keep the skin hydrated. It will nourish and strengthen the hair and add shine. Our Gentle Shampoo for Sensitive Coats and Foals uses no essential oils and the Aloe Vera, Marshmallow Root and Evening Primrose Oil have been carefully chosen to help reduce inflammation, soothe, relieve, repair and revitalize the skin and coat whilst hydrating and maintaining the balance of moisture. This shampoo is super concentrated and can be dilluted at a 32 to 1 ratio. The 300ml is equivalent to 10 litres when dilluted and will give at least 10 washes, the 1ltr is equivalent to 33 litres when dilluted and will give at least 33 washes and the 5ltr bottle is equlivalent to 165 Litres when dilluted and will give at least 165 washes. Our WildWash mixing bottle gives all our dillution rates and makes your shampoo last a long time! 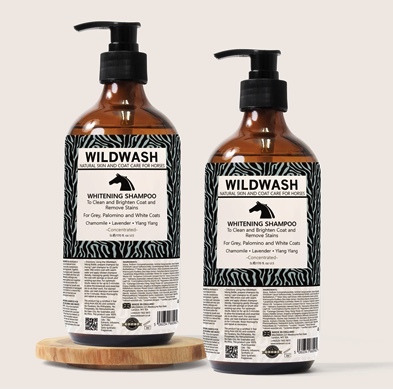 There are currently no questions for Wild Wash Whitening Horse Shampoo - be the first to ask one!